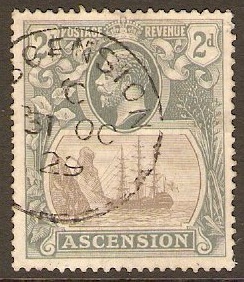 Ascension 1922 ½d. Black and Green. SG1. Very Lightly Mounted Mint 1922 ½d. Black and Green. SG1. 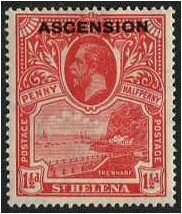 St Helena stamp overprinted with "ASCENSION"
Ascension 1922 1d. Green. SG2. Unmounted Mint 1922 1d. Green. SG2. 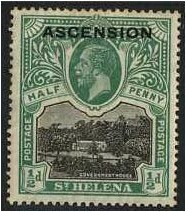 St Helena stamp overprinted with "ASCENSION"
Ascension 1922 1½. Rose-Scarlet. SG3. 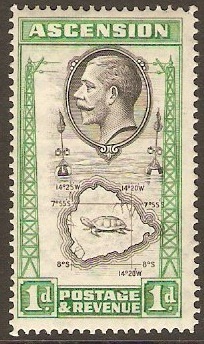 Mounted Mint 1922 1½. Rose-Scarlet. SG3. 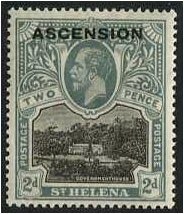 St Helena stamp overprinted with "ASCENSION"
Ascension 1922 2d. Black and Grey. SG4. Lightly Mounted Mint 1922 2d. Black and Grey. SG4. 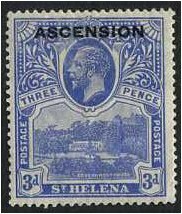 St Helena stamp overprinted with "ASCENSION"
Ascension 1922 3d. Bright Blue. SG5. Mounted Mint 1922 3d. Bright Blue. SG5. 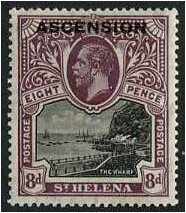 St Helena stamp overprinted with "ASCENSION"
Ascension 1922 8d. Black and Dull Purple. SG6. Very Lightly Mounted Mint 1922 8d. Black and Dull Purple. SG6. 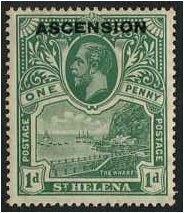 St Helena stamp overprinted with "ASCENSION"
Ascension 1922 1s. Black on Green Paper. SG9. Lightly Mounted Mint 1922 1s. Black on Green Paper. SG9. 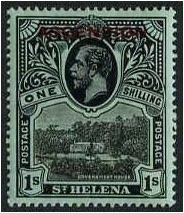 St Helena stamp overprinted with "ASCENSION"
Ascension 1924 ½d Black. SG10. Lightly mounted mint 1924 ½d Black. SG10. 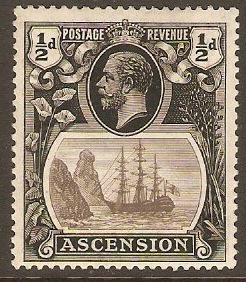 Ascension 1924 2d Grey. SG13. Fine used 1924 2d Grey. SG13. King George V definitive stamp. Cds date 31 October 1929. 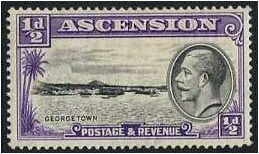 Ascension 1934 ½d Black and violet. SG21. Mounted mint 1934 ½d Black and violet. SG21. King George V definitive stamp.